It was April 22, 1945, and Erickson, along with his fellow tankers of Company A, 43rd Tank Battalion, 12th Armored Division—the Hellcat Division—had just crashed the gate of the Landsberg sub camp, part of the Dachau concentration camp system. Erickson’s company commander’s voice came over the radio: “Everybody, stay in your tanks!” Everyone in Erickson’s tank obeyed. 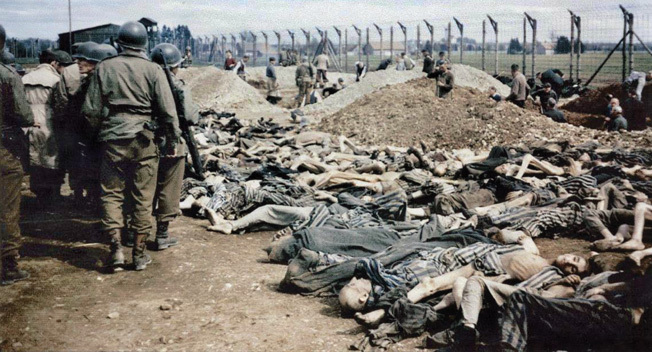 American soldiers force townspeople to dig a mass grave for the deceased inmates of the Landsberg concentration camp. Carl Erickson at first thought the inmates were sick hospital patients. Not long after, the captain came over the radio again: “Who the hell gave them the booze?” One tanker, sympathetic to the prisoners, had given them some of his alcohol, but their bodies could not handle it. After two hours in the nightmarish compound, the tankers pulled out. Only one thing gave Erickson any kind of solace. “I heard the infantry behind us went into the town and got the townspeople to dig graves,” he recalled. Erickson had seen the worst of the war in Europe. He was a long way from his home in Des Moines, Iowa, where almost four years earlier he was working as a bellhop at the Savoy Hotel when he heard the Japanese had attacked Pearl Harbor. As the only boy in a family with five sisters, his father called him “a rose among thorns.” His mother had died when he was 11. He had a girlfriend, Ruth Essick, whom he had been dating for a while. Knowing that his draft number would soon be coming up, Erickson volunteered for the Army and went to Fort Knox, Kentucky, for training and tank school. Upon completion, he remained there as a mechanic repairing M4 Sherman tanks . Ruth even came south to visit. “I thought I had it made,” he said. When he learned that the Western Allies had invaded France on June 6, 1944, D-Day, he worried about being called to the war. He did not have long to wait. Ten days later in New York City, he and 5,000 other troops boarded the SS Louis Pasteur, a turbine steam ship that had been converted into a troop ship. Its zig-zagging journey across the Atlantic was rough, with many soldiers succumbing to sea sickness. Yet it never bothered Erickson, who had a job as a top deck gunner. The ship arrived off the coast of western England but remained outside Liverpool for two days, waiting for the tide to rise. Once the ship docked, Erickson and his fellow replacements traveled across England in railcars, sailed across the English Channel, and landed at La Havre, France. At a replacement depot, he and eight other replacements stood around a table as Captain Ivan Woods from Maj. Gen. Roderick Allen’s 12th Armored Division asked everyone their military occupational specialties. Erickson said he was trained as a tank mechanic. “If you can fix ‘em you can drive ‘em,” said Woods. Erickson was now a driver for A Company, 43rd Tank Battalion, Combat Command A (CCA). The 12th Armored fought under Lt. Gen. Alexander “Sandy” Patch’s U.S. Seventh Army, which had landed in southern France on August 15, 1944, and fought its way to the German border. The 43rd Tank Battalion was in desperate need of tankers. At the small border town of Herrlisheim in the first weeks of January 1945, German tanks of the 10th SS Panzer Division nearly destroyed the battalion and captured its commander, Lt. Col. Nicholas Novosel (originally listed as killed in action). After the battle, the Germans reported that they had captured some 300 American soldiers and destroyed 50 tanks, including some of CCB’s 23rd Tank Battalion. “No one ever said ‘12th Armored Division,’” explained Erickson. “They said 43rd Tank Battalion.” Captain Woods, who had previously been a forward observer, introduced Erickson to his new tank crew. Today, Erickson can only remember some of their last names: Wiggins, the tank commander; Williams, the gunner; Rominelli, the loader; and the bow gunner, whose name Erickson has forgotten. The M4A3 Sherman tank, nicknamed Anticipation, would be Erickson’s home for the next month, “as well as my bedroom and bathroom,” he recalled. The men had decorated the inside of the tank with pinups, which stood out against the white interior. Outside, spare tracks hung on the sloped frontal armor and sandbags covered certain parts, as a defense against German Panzerfausts, shoulder-fired antitank weapons. Erickson’s driver’s seat was on the left side of the tank. There were only two foot pedals, one for gas and a clutch for shifting gears. He steered with two levers and shifted speeds with a gear stick next to his right leg. The top gear put the tank in reverse while the other four were for different forward speeds. To brake, he would pull back on both levers as hard as he could. The hatch above his head contained a periscope, which he found difficult to see through. He preferred to just stick his head out of the port. The dashboard included a speedometer and tachometer and oil pressure, temperature, and fuel gauges. Most important to Erickson was the storage space above and to the left of the instrument panel where he kept a bottle of booze. “I kept whatever I could find,” he recalled. After the Battle of Herrlisheim , the 12th Armored’s next mission was to help capture the French city of Colmar inside a German-held 850-square-mile salient in the Allied line that had to be eliminated. While the French I Corps pressed from the south on January 20, the U.S. 28th Infantry and the French 5th Armored Divisions cleared the northern side of the bulge. On February 2, the 12th Armored joined the fight in the north and passed through Colmar, encountering little resistance. Once the Americans were through the city, however, the Germans put up a fight. Prior to driving a tank in Europe, Erickson repaired M-4 Sherman tanks at Fort Knox, Kentucky. Rominelli, the loader, was also great at his job. Erickson recalled that he could load a shell just as soon as the spent casing popped out of the cannon’s breech. One time he was doing his job so quickly that the projectile of one of the shells came off, pouring gunpowder all over the tank’s interior. Captain Woods ordered the tank off the line. It would take two days to completely clean it. During the fighting Erickson got to know the men of the Red Ball Express , African American soldiers driving trucks day and night to supply the frontline soldiers with food, fuel, and ammunition during the race across northern France. By the time of Colmar, any supply soldiers were considered Red Ballers. They arrived nightly at the front to refuel and rearm the tanks. Erickson would stand atop the rear right side of the tank as black soldiers handed up five-gallon gas cans that he poured into the gas tank. It took 37 cans to fill the Sherman’s 185-gallon gas tank. While Erickson poured gas, other soldiers filled the vehicle with ammunition. One night, the Red Ball soldiers grew anxious as tracers and explosions lit up the night sky. “They were tickled to death to get out of there,” said Erickson. Erickson remembered the fighting south of Colmar simply for a lot of shooting. “We burned up a lot of ammunition,” he explained. At one point his tank was recruited as a stretcher bearer. The crew put a Red Cross flag on the tank before Erickson drove it onto an open field where the wounded were hoisted onboard for the ride back to a medical station. Once done with Colmar, the division turned east for the German border. 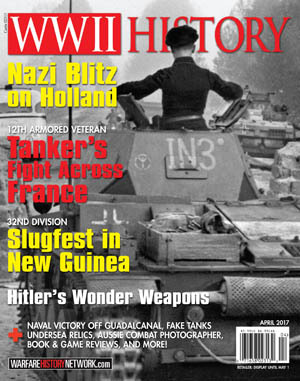 Erickson’s tank reached the Maginot Line , the French line of concrete fortifications built in the 1930s along the German, Belgian, and Swiss borders. Erickson and a fellow tanker dismounted and went exploring, only to get lost inside one of the bunkers. They fumbled around in the poorly lit rooms, finding nothing but German ammunition. “It was enough to spook me,” he recalled. Next, they came across the Siegfried Line, Germany’s line of defense. Erickson’s tank rolled through a path between concrete pylons called Dragon’s Teeth, which had been plowed out of the way. A Sherman tank plows through a gap in the Dragon’s Teeth of the German Siegfried Line. Dragon’s Teeth were no deterrent to Erickson and his tankmates. For food, the men enjoyed the 10-in-1 rations  “when they showed up,” said Erickson, but mostly they ate C-rations. There were four kinds of C-rations, but Erickson felt he only got beans and wieners. “I got sick of them things.” When the men were not eating, they smoked the cigarettes that came with their rations. “The Army learned [sic] me how to smoke,” he mused. To keep warm during the late winter and early spring, the men would close all the hatches and keep the engine running. Once the oil in its 55-gallon tank warmed up it became comfortable. Infantrymen would lean up against the tank for warmth, and when they could the crew invited a few inside to get warm. Erickson and his crew received a Sherman M4A3-E8, known as an “Easy 8,” as a replacement vehicle. The improved version of the Sherman had wider tracks, thicker armor, and a 76mm high-velocity cannon. It would not be long before that tank was damaged, too. Driving around a curve in a town, Erickson lost control. The tank slipped sideways, catching a streetcar track and damaging the tank’s tracks. “I took out about a block of track before we stopped,” he remembered. After the battle for Colmar, the 12th Armored went into corps reserve in mid-February and remained off the line until March. During its down time, the division received several companies of African American soldiers to replenish its depleted armored infantry. On March 17, the 12th Armored Division transferred to Lt. Gen. George S. Patton, Jr.’s Third Army to help him race for the Rhine River , the last natural barrier into Germany. Patton welcomed the 12th Armored with a fiery speech in a large field near Sierck-les-Baines, France. Erickson remembered that Patton preached to the men: “I’ll reach the Rhine first if I have to take a 6-by-6 Mack Truck to haul back the dog tags!” One of Patton’s first orders was for everyone to remove their division patches to keep the Germans believing the 12th was still under Seventh Army. The 12th started the drive for the Rhine the next day, barreling through light opposition. Erickson remembered passing through the German city of Trier, which had been captured by the 10th Armored Division two weeks earlier, but he had no recollections of seeing either the city’s black gate (the Porta Nigra) or the Roman amphitheater. Elements of the 12th reached the Rhine on March 20 and four days later linked up with the 14th Armored Division coming up from the south. Erickson crossed the river at night near the city of Worms over a treadway bridge. Guided by an infantryman, he drove slowly across the bridge. The tank rose as it approached each pontoon and dipped as it rolled off. “If I had seen that in daylight,” said Erickson, “I would have gone AWOL.” His one regret: “I didn’t get a chance to see Patton water the Rhine ,” he said about the General’s famous bathroom break. Relief from the front was never long. Once while the men were resting and relaxing they received orders to relieve another armored division. 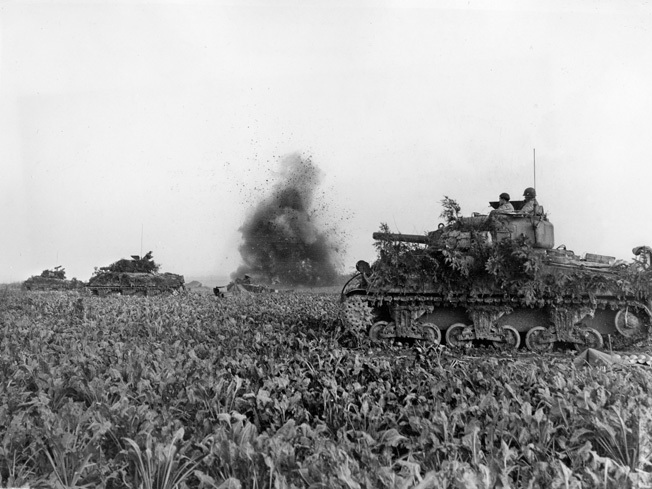 Erickson’s tank joined a convoy of tanks charging for the front. In the distance he could see a fork in the road where an MP with white gloves directed traffic next to a jeep in front of a house. But by the time Erickson’s tank reached the fork the MP was gone, the jeep had been flattened, and the house’s front steps had been crushed. The tankers did not have time to stop, much less slow down. 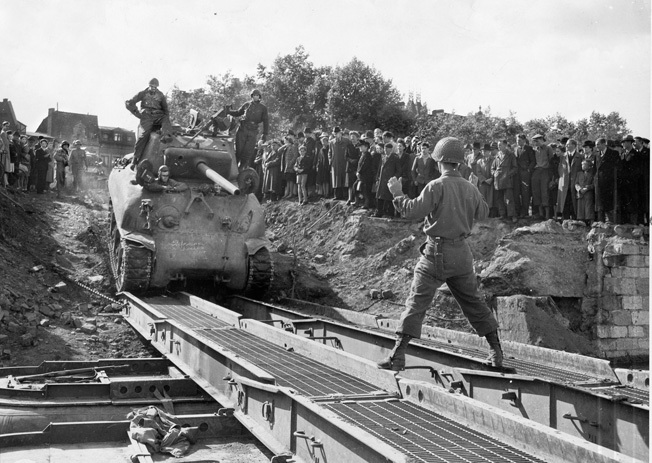 A soldier guides a tank crew onto a Treadway bridge as local villagers look on. Erickson drove his tank across a similar bridge over the Rhine River at night, admitting that if he had seen the bridge in daylight he would have gone AWOL. Once the 12th crossed the Rhine River it returned to Patch’s Seventh Army on March 24. It had fought under Patton for only a week and was now the spearhead for Seventh Army. The division was given a short break before returning to battle. Erickson and his crew enjoyed themselves in Heidelberg by liberating three large beer barrels. They placed one on the front of their tank and two on the back. As they rolled along, their engine heated up the beer barrels in the rear. The cork on one of the rear barrels blew out, and a stream of beer shot 20 feet into the air. Erickson had to take an axe to the barrel to open it. “We lost half of that beer,” he lamented. In early April, Erickson’s company approached the German town of Würzburg, and a Panzerfaust round exploded against the tank in front of him. The damaged tank stopped. Erickson watched as a German came out of a building and walked around the tank. Suddenly, a tanker named Allen jumped from the top of the tank onto the German. “He gave the German the Brooklyn version of the goose,” explained Erickson, meaning he stuck two fingers into his eyes. Then Allen grabbed the German’s Mauser pistol and shot him. “I can still see that,” recalled Erickson. The 12th continued eastward. On April 22, the tankers fought their way into the town of Dillingen on the Danube River, where they found German soldiers preparing a bridge for demolition. While Erickson and his fellow tankers fired across the river, the armored infantry charged the bridge. “We caught them by surprise,” said Erickson. Once they chased the Germans out of the area, the Americans discovered six 500-pound aircraft bombs underneath the bridge. Engineers were called in to deactivate the bombs. Erickson’s crew spent the night on the west side of the bridge and crossed the next day. Four days later, Erickson followed another tank through the gate of a large complex near Landsberg. That was when he saw the evidence of Adolf Hitler’s real Germany, the Landsberg Concentration Camp. Erickson left the camp shocked at the sight of so many human beings so close to death, but he was pleased to hear the infantry had put the local populace to work digging graves. 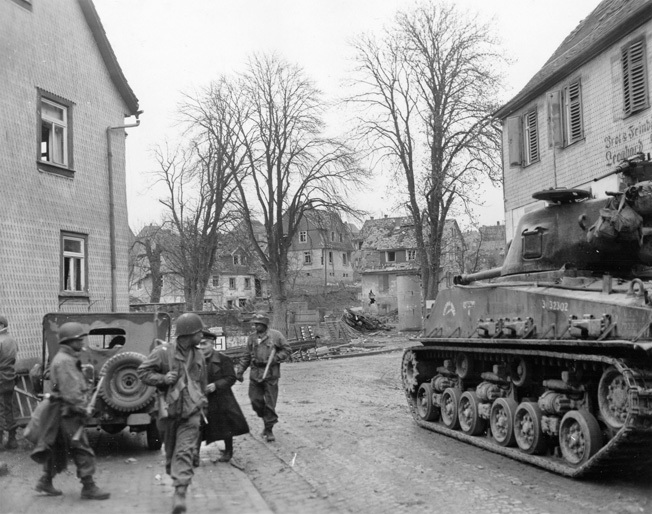 A 12th Armored Division M4A3-E8 “Easy 8” tank supports African American infantry from the 66th Armored Infantry Regiment as they capture a German prisoner in the city of Erbach. The Germans, with few tanks and almost no gas, relied more and more on Panzerfausts, which were not always effective. One tank took a hit right on the front corner where two armor plates were welded together. “That round never came in,” explained Erickson. One night the Germans had dug into the side of a hill, where they fired Panzerfausts in an effort to slow the speeding tanks. It did not work. As April turned to May, the German Army imploded. Erickson saw thousands of surrendered Germans walking west into prisoner of war camps. He offered them cigarettes and food. “There was no fight left in them,” he explained. The division liberated more than 2,800 Allied prisoners, including 1,400 Americans. Erickson recalled seeing large numbers of liberated Americans walking on the roads in the beautiful countryside. “I really didn’t think we were that close to the end of the war,” he recalled. When Erickson turned in his tank, it was missing its Thompson submachine gun but contained the African American infantryman’s rifle. No one cared. “We were celebrating,” said Erickson. Erickson was put in charge of a house billeting soldiers. The woman owner served as the maid and cleaning lady. One day two of his buddies butchered two of her chickens. She furiously complained to Erickson, but he could not understand her. To make it up to her, he retrieved a can of coffee grounds from the mess hall and gave it to her. “She was tickled pink!” he laughed. 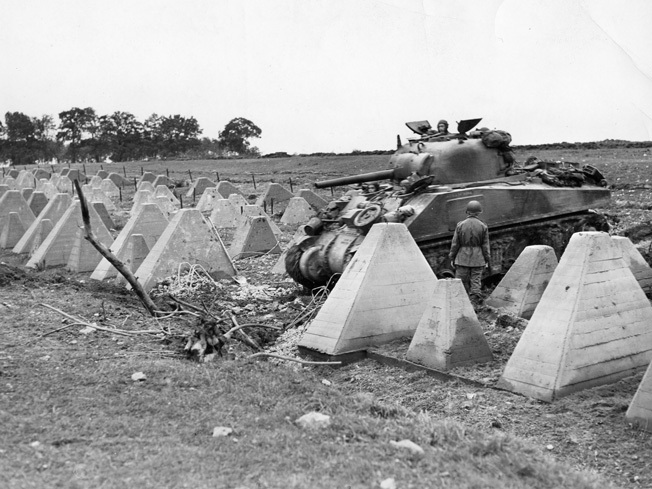 Well-camouflaged American Sherman tanks assault an enemy pillbox along the German Siegfried Line. 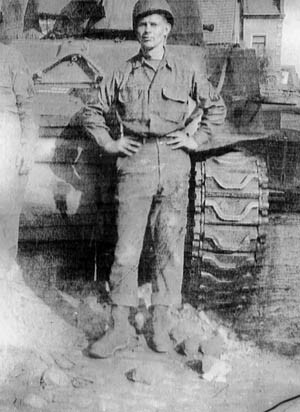 Sergeant Carl Erickson drove a Sherman for the 12th Armored Division’s 43rd Tank Battalion from the French border deep into the heart of Germany. While the war in Europe had ended, Japan fought on. The 12th Armored Division was selected to be part of the invasion of the Japanese home islands. Erickson and his crew departed France in a Liberty ship headed for the United States. Halfway across the Atlantic, they learned the United States had dropped an atomic bomb on Hiroshima, and then Nagasaki. Finally, on August 10, the men learned that Japan had surrendered. The war was over. Erickson spent the trip playing cards and dice. “I had $1,400 in my pocket when I left,” he recalled. “When we pulled into New York I had none.” It was the last time he ever gambled. As Erickson’s ship approached New York City, he stood on deck for three hours just watching the Statue of Liberty fill the horizon. Once docked, the men disembarked and reported to Camp Shanks, where they enjoyed T-bone steaks. “It was the best steak I ever ate,” he recalled. Soon, Erickson boarded a train to Philadelphia and then transferred to one bound for St. Louis and finally to Spencer, Iowa. As the train neared its final destination, Erickson began to cry, but he decided he did not want to be a baby and stopped. Ruth, his father, and sisters were waiting for him as he stepped off the passenger car. Erickson was home. Within a month of returning, Erickson married Ruth. They had five boys and one girl. One of the boys, David, served with the U.S. Air Force in Vietnam where he loaded Agent Orange onto planes. He later died of cancer, most likely related to his service. Erickson also lost his daughter, and Ruth died in 1977. Erickson married his sister-in-law, Ardie, and they have been together, as of 2016, for 40 years. She brought two sons and three daughters to the marriage. Together they have 11 children, 29 grandchildren, 44 great grandchildren, and three great, great grandchildren. Soon after returning home from the war, Erickson used the GI Bill to learn machine work and took a job in a forge. In 1960, he bought his own shop in Albert City, Iowa. He eventually sold it to his sons and bought a John Deere dealership in Montana, which he owned for five years before going back to Iowa and working in a welding shop until he retired. 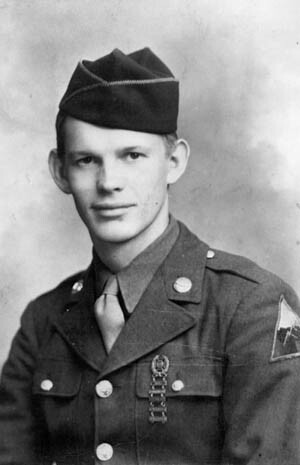 Carl Erickson grew up in Des Moines, Iowa, before volunteering for the U.S. Army. Erickson never spoke about the war until one of his adult sons asked him to address a classroom about his experiences. It was hard, but Erickson faced his past and explained the horrors of World War II to the students. He has been comfortable speaking about the war ever since, although he cannot always remember all the details. In the late 1990s, Erickson visited the 12th Armored Division Memorial Museum in Abilene, Texas. He spent three hours touring the artifacts and reading the information panels. Then he entered the museum’s Holocaust Room. “It just threw me,” he recalled. “I could smell it, but it was just something in my head.” The war, so far behind him, could still feel immediate. The smell of dead bodies still lingered in his nostrils. Frequent contributor Kevin M. Hymel is the historian for the U.S. Air Force Chaplain Corps and author of Patton’s Photographs: War as He Saw It. He is also a tour guide for Stephen Ambrose Historical Tours and leads a tour of General George S. Patton’s battlefields.